Rick Odello, Vicki Schaffer and Tom Maiello. At the DCI Annual Meeting last weekend in Indianapolis, Open Class corps directors elected committee officers, discussed best practices for their organizations, planned their Championships in Michigan City and Indianapolis, and adopted a strategic plan to guide them through the next five years. Advisory Committee Elections Colt Cadets Director Vicki Schaffer was re-elected chair of the Open Class Advisory Committee and Tom Maiello (Raiders) was re-elected vice chair. Other Advisory Committee members include Rick Odello (Blue Devils B & C), Ibe Sodawalla (Legends), and newly elected officers Tim Rall (7th Regiment), Mike Quillen (Oregon Crusaders) and Mark Ripley (Blue Saints). Looking Ahead to August Schaffer led the Open Class corps directors through several discussions that included planning for the week of the 2010 World Championships. Open Class competitive events will once again kick off with the Quarterfinals in Michigan City, Ind. on Tuesday, Aug. 10. In addition, the city will host an opening ceremony on Aug. 9, as well as the new Individual & Ensemble Competition for Open Class corps on Wednesday, Aug. 11. Strategic Planning Directors engaged in a lively brainstorming session to formulate a strategic plan for the next five years. The plan is based on specific goals for Open Class corps within DCI's overarching business plan for 2010 and beyond. 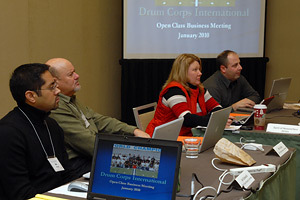 As part of the planning process, the directors approved a mission statement to guide Open Class objectives: Open Class exists to provide life changing experiences for our youth participants by encouraging, developing, and supporting existing corps, new or re-emerging corps, and those corps whose goal is to compete in DCI's World Class. "Open Class corps offer great diversity in the way they deliver the drum corps experience to their members," said Open Class Coordinator David Eddleman. "We continue to work hard to support the development of new and existing corps under the Open Class banner, and we're pleased with our continuing success in this area. If you look to the current ranks of the World Class, you'll see that ten of the 23 corps have previously competed as Open Class corps." Congratulations Directors congratulated 2009 Open Class Finalist Teal Sound and director Randy Blackburn. This past weekend, the Florida corps was granted access by the Drum Corps International voting membership to compete in World Class competitions starting with the 2010 season. "Teal Sound has been a classy and consistently competitive corps in the Open Class," said Eddleman. "Randy is a first-rate drum corps director and has been an active participant in our business meetings. We will miss Teal Sound's performances at Open Class shows as well as Randy's contributions in the committee room."